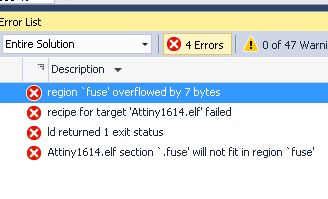 I had no problem using such a format to include the fuse setting in the ELF file. However, an error occurs in tiny1616. Is this a deficiency in device definition? Please tell me if there is a better form. Kabasan, What you posted above works fine here, no errors. Look for the definitions in iotn1616.h. There has been an error in the ATDF file that has caused this errors. Try to update to the latest ATtiny_DFP 1.3.172 (http://packs.download.atmel.com/). ... Try to update to the latest ATtiny_DFP 1.3.172 (http://packs.download.atmel.com/). That is the answer Kabasan. Please mark post #3 as the solution. Thank you very much. I successfully built it. I thought Studio would automatically announce the update, but my environment was stopped at 1.3.147. Um, what kind of operation should I mark this problem as resolved? Glad you posted, I had the wrong post # in my earlier post, apologies to je_ruud. Kabasan, did you brick your chip with the fuse settings you specified in post #1? EDIT: If you haven't compiled and written this to a chip yet, I strongly advise that you don't. It will brick your chip! See the next post for more details. @meolsen, see this post and the thread it is in. Programmatically setting the fuses with empty parameters as in the OP here will definitely brick the chip, and only 12V UPDI programming seems to be the solution. Looking forward to seeing you there. I am sorry for my poor source being disaster. That source is in the middle of writing, the complete version looks like this. I knew in advance that disabling UPDI would require high voltage programming and that AtmelIce could not do it beforehand and it did not get into trouble. Another advice of # 10, I am using AtmelStudio on two PCs and I keep flagging both. However, "Atmel ATmega Series Device Support (1.2.209)" and "Atmel ATtiny Series Device Support (1.3.172)" were not announced. It may be something's wrong, but for me this is not very important, so I am waiting for the day to be resolved naturally. No need to be sorry Kabasan, I was warning you not to use it, my disaster was accidental. Actually now that it happened there is an opportunity to create a fix that may benefit many. Thank you. *EDIT: I manually downloaded the 1.3.172 pack , installed and it appears to work fine. I thought i read the numbers correct and was up to date. I am using the AS7 command prompt to load a .cmd batch file for programming my Attiny1614 with an ICE. Could i add manual fuse programming separate with commands in AS7 command prompt (just like AvrDude)? and it will display information that should be enough for what you want to do. I will explore other commands with atprogram, currently i have a .cmd batch file to enter in the commands automatically. atprogram does show the fuses info once you type: atprogram help write. So its an option thankfully, I did get the fuses in the source code to work with my .elf file. That is 9 bytes and the error says "overflow by 7 bytes" which suggests that __FUSE_REGION_LENGTH__ is defined as 2 rather than the 9 it should be. The very old AVRs had just 2 fuse bytes (low / high) so I think someone somewhere has made a copy/paste error where they have used an old AVR definition as the template for defining this symbol for these new Xtiny models. Clearly this looks like a bug in Atmel world so I'd raise a support ticket with Microchip so they are aware. It might be that Morten or Jan-Egil or someone will read about it here but you'll have more success if you raise a ticket so it goes into their Bugzilla/JIRA/whatever. So the feature was added by Senthil who is an engineer working for Atmel and it shows that it is binutils that is responsible for the symbol definition. Clawson thank you for your in dept reply, but i downloaded the newest pack: Attiny_DFP 1.3.172 and it allowed me to compile correctly with the fuse settings inside the source code. I originally thought i was up to date, was not the case. So it looks like they changed the .x file - seems like good news!